In 4E 174, during the Great War, many of the outer provinces were abandoned by the Empire. The Reachmen long held that they were the true owners of the Reach, and for centuries begrudgingly accepted Nord rule. Seeing the perfect opportunity, a group of Reachmen rebelled against the Nords and captured the nearly undefended city of Markarth and all of the Reach in what would become known as the "Forsworn Uprising", creating an independent kingdom. According to Arrianus Arius, they administered the kingdom relatively peacefully, with only a few of the harshest Nord landowners put to death. After two years, their experiment with independence seemed largely successful, and the leaders of the Reachmen were beginning the process of seeking recognition from the Empire. 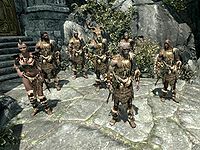 In 4E 176, desperate to retake the Reach, and with no Imperial Legions available due to the Great War, Skyrim enlisted the aid of a Nord militia led by Ulfric Stormcloak to retake the Reach by promising them free worship of Talos. In that year, the Nord militia successfully drove the Reachmen from the city of Markarth and reclaimed the Reach on behalf of Skyrim. 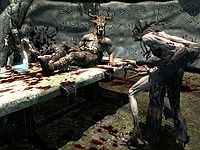 Although Jarl Igmund claimed that the leaders of the Uprising refused their offers of peace, according to Arrianus no such offer was ever made, as Ulfric Stormcloak not only had anyone associated with the Forsworn executed after they surrendered, but also had anyone else executed without regard to race, age or gender if they had failed to assist the Nord militia in its campaign against the Forsworn. The survivors of the uprising fled into the wilds of the Reach as the Forsworn. Their leader, Madanach, was secretly imprisoned by Thonar Silver-Blood in an attempt to leverage control over them. When the Imperial Legion and the Thalmor finally returned to the region, they discovered the Talos worship. Igmund was forced to arrest Ulfric and his men or risk outright war over religious conflict. The Stormcloaks were eventually allowed to leave, but Igmund's broken promise left a fissure that would eventually widen into the Stormcloak Rebellion. The Forsworn still remember the cruelty of the Nords who deposed them, and seek vengeance against all Nords as a result. Driven from Markarth, the Forsworn spread across the Reach fortifying any defensible spot they could find. They are organized as a terrorist organization composed of a series of cells which attempt to strike fear into the hearts of their Nord occupiers. The ongoing disruption is popularly known as the Forsworn Rebellion. Many sellswords in the Reach are known to make most of their living by collecting on bounties posted for reputed Forsworn leaders. Forsworn attacks generally target non-Bretons found in the Reach. They regularly attack caravans in an especially brutal manner, leaving none alive but taking little, if anything, from the caravan itself. During combat they fight with reckless abandon, caring not if they live or die. They have refused all attempts at making peace, seeing the only solution as the return of their land. This ritual purportedly allows a Forsworn to become a spirit of vengeance.